A fanart for YanSim, be sure to check out this indie game! It's even creepier with this music: youtu.be/jDr59cuv1io. 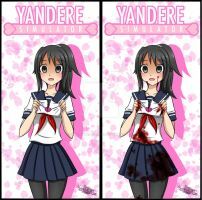 She's at her best: being Yandere. Awesome art too! By far my favorite picture of yours so far, saw this picture used on a music channel and traced it back to here, still my favorite though tbh and I'm definitely keeping it for future pfps. Keep at it man. no, this is very good!! i cant even draw like that no mater how hard i try! your awesome!! It's my impression or she is really short in this pic? But I like it, she looks cute. Your art is amazing. 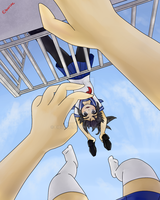 No matter what it takes, I'll do anything for Senpai to be free. And anybody who gets in the way will suffer my unholy wrath. eheheheheh.... Senpai??? That's my impression of a Yandere, i think. I just love everything about his game, it will be awesome to play the final version of this game. But I have to admit I get pretty hyped every time the developer post a video about some new features or other ideas for the game. Keep up the great artwork!! Do you think you could just add a link to this page in the description? thanks! Of course! I should've done that from the start. i think about this picture a lot, it's just so pretty u_u you did super well!!! I wouldn't change ANYTHING in this picture! It's so beautiful and well drawn! absolutely awesome. glad yanderedev posted this, deserves so much more attention. I was so happy to see that he had shared it on the website Thank you so much for the compliments!